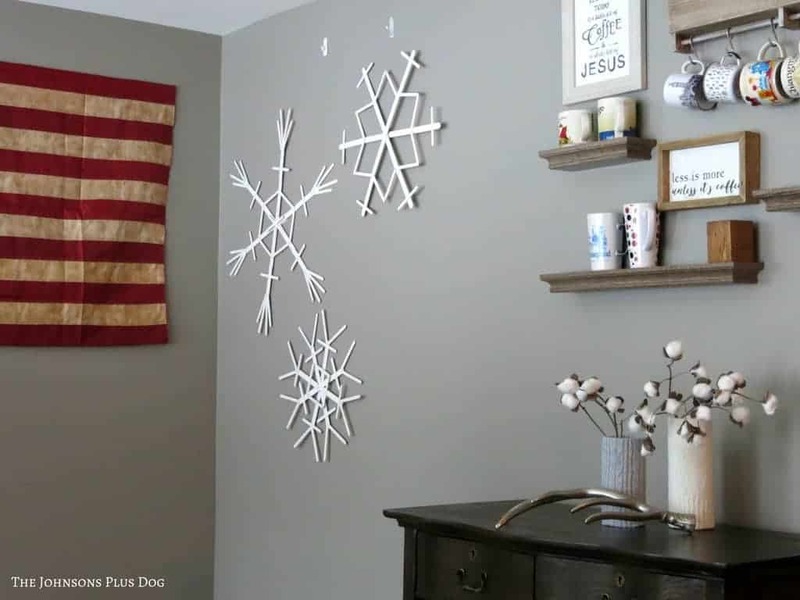 These popsicle stick snowflakes are perfect winter crafts for kids (and adults!) that you can display in your home. They add a ton of dramatic winter spirit to decorate a big open wall or as winter window decorations. UPDATE: Here’s the video in case you missed it!! If you love videos, check out my video page to watch more. 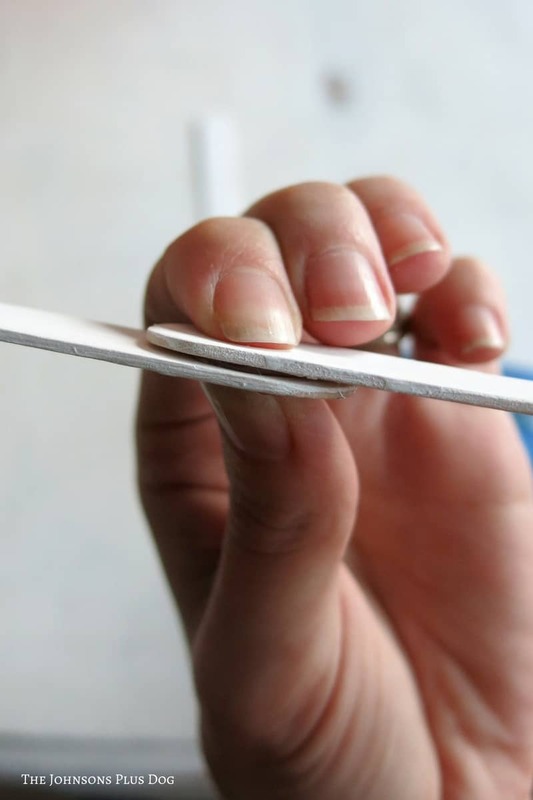 Hot Glue (or 3-in-1 glue) – The 3-in-1 glue is a little easier to move around while you’re putting it together because it takes about 10 seconds or so to set, whereas hot glue is a little more immediate. I used both and they both work good! You’re going to want to start with a bunch of wooden craft sticks. I used both the jumbo size and the regular. The jumbo size ones were used for the center structure of the snowflake. My wonderful in-laws were in town after Christmas when I was working on these and my mother-in-law jumped in and helped out. 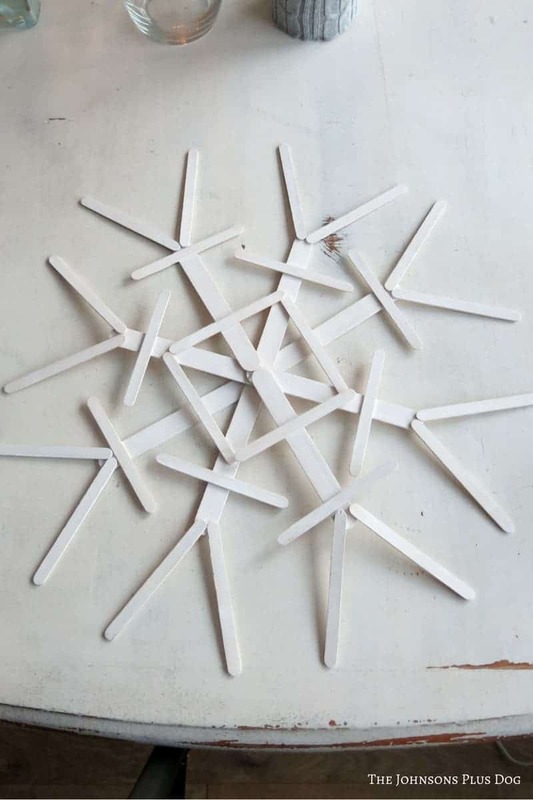 After we finished making them, she ended up finding some mini size wooden craft sticks too that are awesome for the smaller more intricate details of the snowflakes. 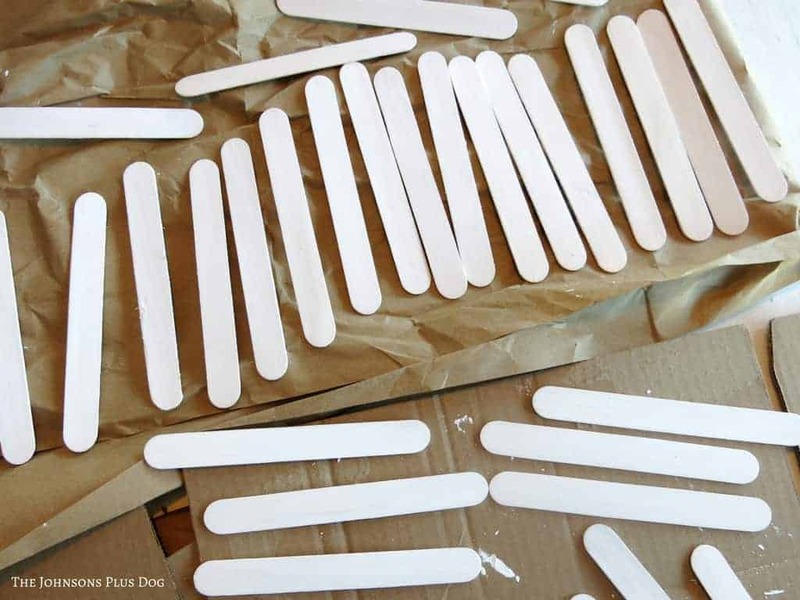 I started by painting all of the wooden sticks white. 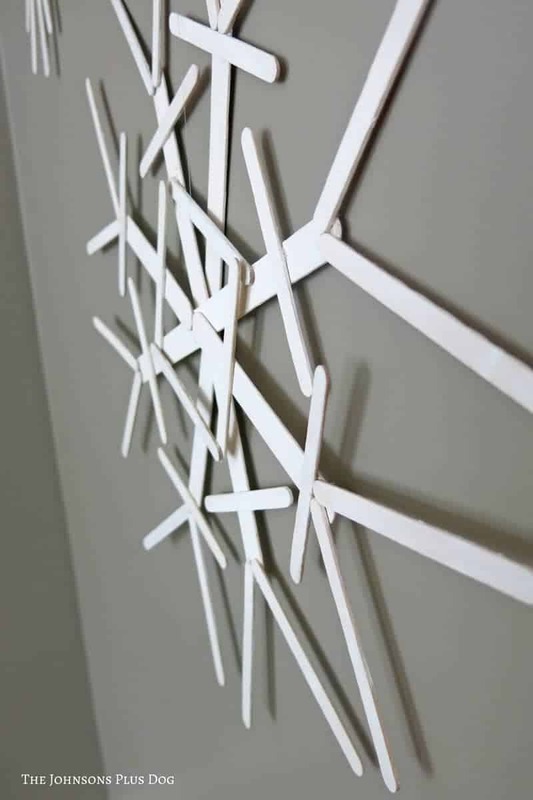 Alternatively, you could paint them after you put the snowflake together… you could even spray paint them afterward instead too. Next you’ll put the main structure of the snowflake together with the jumbo wooden sticks. 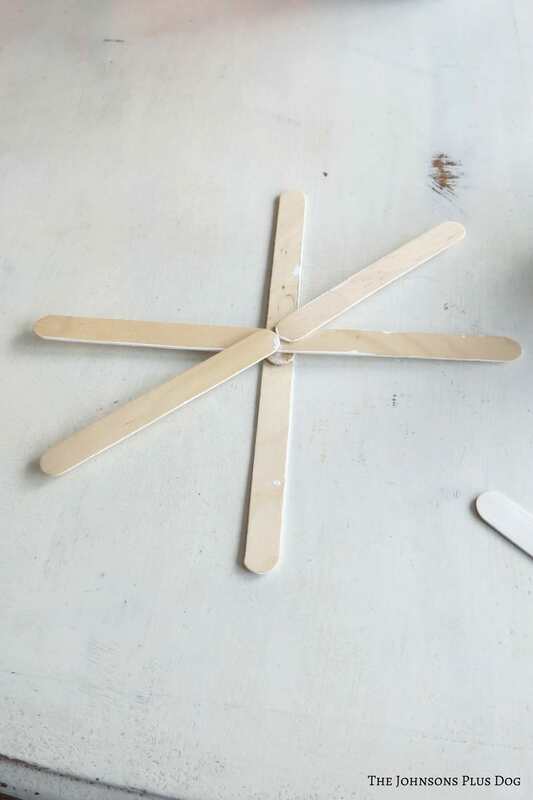 You’ll overlap the popsicle sticks slightly. We found it pretty difficult to line up the snowflakes with 6 points (3 main sticks crossing each other). It’s was much easier to make the snowflakes with the 8 points (4 main sticks in the middle). It was a lot easier to make those geometrically accurate, so I’d recommend starting with those. Once you get the main structure of the snowflake built, it works best to layout the rest of the detail so you have a plan in place. After you lay it out, you just glue the detail sticks on with the hot glue. To attach the snowflakes to the wall, I both attached a command velcro strip on the back of one. The other ones were hung with a command hood and then I attached the snowflakes with fishing line. They are so beautiful! 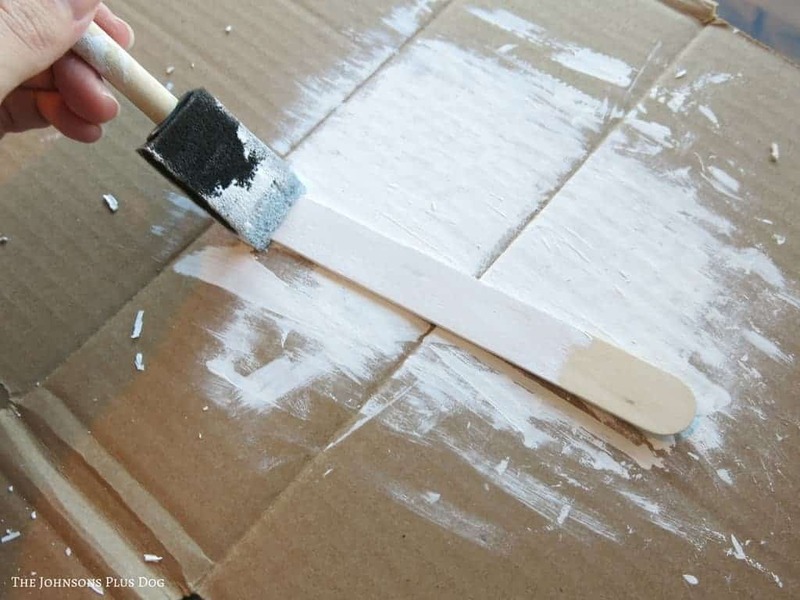 What a fantastic diy idea! Thanks Krysti, I had so much fun making these! These are pretty and very unique! They’re a lot bigger than I expected when I first clicked on it (expecting popsicle stick size). 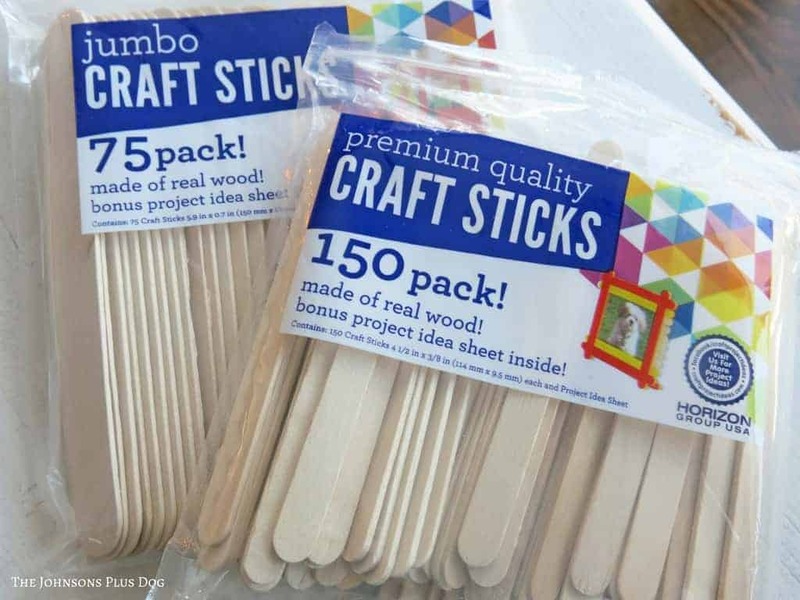 I see you did use smaller craft sticks in your design – of course, they could be used by themselves to make smaller snowflakes, too. 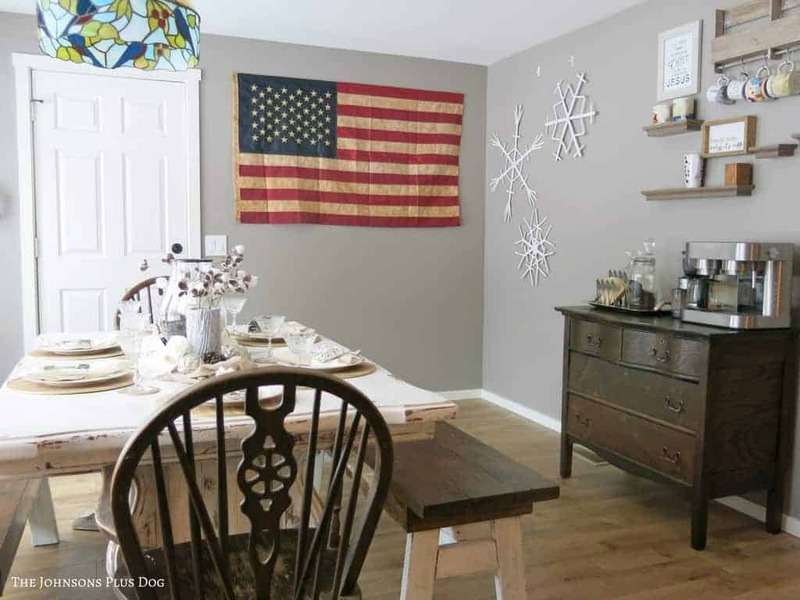 I would also paint the backs so I could hang them loosely (from ceiling or wall) AND add a dusting of white or silver glitter to make them twinkle a little bit (I gotta have some bling!) like real snowflakes! To bling them even more, you could add little crystals or gem shapes to the intersecting points and to the center. Thanks for the inspiration! Thanks so much!! 🙂 Yes, one of the things I love about this DIY is that you can really get creative with them! Big or small, simple or bedazzled, on the wall or in a window! I’m so glad that you were inspired. I’d love to know how they turn out if you make them! Hope you have a great day!